I got back from Madrona on Monday (and thank you, Jet Blue, for letting me go standby! got home 4 hrs earlier than would’ve otherwise). It was a whirlwind. I taught a class, I took a couple classes, I performed in the teacher talent show (oh, if you weren’t there, you missed a fun, fun time! ), I hung out with friends, I petted lots of yarn and fiber, and I actually worked a day in the middle of the weekend redoing charts for CRK (all updated now). More later. I promise. Three days of vet work, then I’m off to Stitches on Friday morning. Find me at the Bijou Basin booth; if I’m not there, I’m wandering around saying hi to folks. 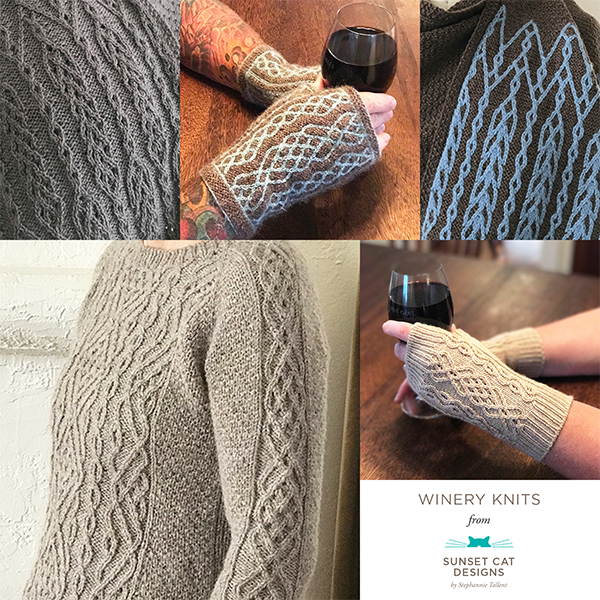 But I’ll be there most of the time, with hard copies of the Undersea Garden Cowl pattern from CRK (which is getting ever so closer to final) and my Don’t Fence Me In mitts. What all else has been going on? I’m swatching, charting, sketching etc for patterns for the next book. I’m working on classes for the Knitcircus retreat. My website got hacked a week & a half ago, so I’m still doing some mop up on that. (Thanks, Dreamhost: NOT.) I’m thinking of adding PinIt! buttons since I’m futzing with the site anyways. I’m updating my old Sanguine Gryphon patterns (Zylphia & Simone being first & second in line). Photography is the main hold up on these, but I’m thinking of releasing them with my current non-fancy pics then updating with purty pics once taken. Comments? There’s a plethora of lovely pics up on Ravelry for reference. I’m still squeezing in tech editing, of course. That’s about it. I’m actually going to try to do most of my packing for Stitches tonight, since Rosemary & Curtis are visiting for dinner tomorrow.